YES, you can play the new SimCity on a Surface Pro. I did just that for a couple of hours last night. There’s even limited touch support. I was quite pleased with the experience. You’ll need to download a beta version of the Origin client from EA’s forums. If you’re running the currently released version of Origin (as I was) you’ll get a bogus error about “The game will not run in a virtual environment”. Thanks again to Scott Lowe at IGN for pointing this out. The game runs – in my opinion – just fine on the Surface Pro. Remember, though, that it’s a supremely portable two pound device and not a gaming PC that you can heat your house with. If you’re expecting it to run this game at 1920×1080 with all the graphical settings maxed out you’ll be disappointed. If that’s what you’re after then a computer with an Intel i5 CPU and Intel’s integrated HD4000 graphics might not be right for you. I’ve fiddled with a bunch of options, and right now I’m running the game in a 1366×768 window. That lets me keep up with IM & Twitter while I’m playing without having to spend all my time working my ALT+TAB keys. AgentM says “Wanna know where War Machine was during @Avengers? Wanna more #MCU timeline info? Get the #IronMan 3 prelude comic. Also, it’s great!”. SOLD. It’s the FIRST ISSUE OF THE NEW AVENGERS. The X-Men will always be my first true comic love. So far I’m really happy with where the series is going. This series is being written by Kieron Gillen, and it’s brilliant. If you’re not familiar with his writing, do yourself a favor and track it down. What’d you pick up this week? 24 hours are gone and so are we. $5,333 raised for Seattle Children’s Hospital. Thank you all! It’s gametime! For the next 24 hours I’ll be gaming to raise money for Seattle Children’s Hospital. We’ve already raised $2,500 $3,214 $4,581 but I’d love to see us get to $5,000. If you can, please DONATE. There’s a livestream and chat running on twitch.tv/thevowel if you’d like to join the fun! It should be really entertaining when the sleep deprivation hits. If that’s not your style, we also have Rewards for donations! THANK YOU FOR SUPPORTING SEATTLE CHILDREN’S HOSPITAL! 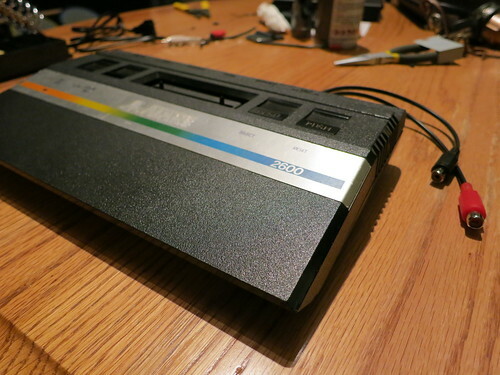 For some time now I’ve been toying with the idea of performing surgery on my Atari 2600. Being decades-old, the only A/V output on it is RF. The quality of signals over RF is lousy by today’s standards, not to mention that most TVs don’t have RF inputs anymore! Wednesday was the 40th anniversary of the founding of Atari, Inc. – and that was the push I needed to finally get this done. I was able to con @lawjick into coming over to help out, which was a really good thing because there were several points at which I really needed three or four hands to do this right. Everything we’ll be connecting to is in the center of that photo. 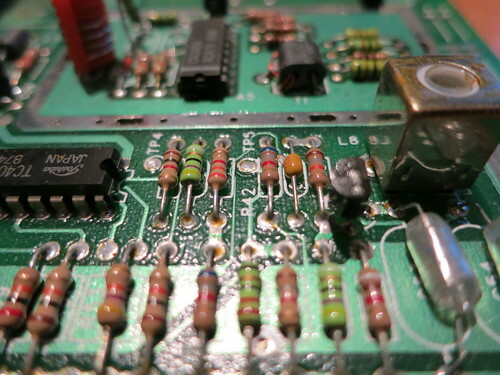 R41 (the rightmost of the group of three resistors just left of photo center), TP5, and C19 (the capacitor between two resistors just right of photo center). Solder a jumper from the lower pin of R41 to TP5. Solder what will be the video cable to TP5 and ground. Solder what will be the audio cable to the lower pin of C19 and ground. I’ll leave one small bit of wisdom here. Test everything before you put it back together! If you take basic precautions there’s no reason you can’t make sure everything is working without the case and RF shield being attached. 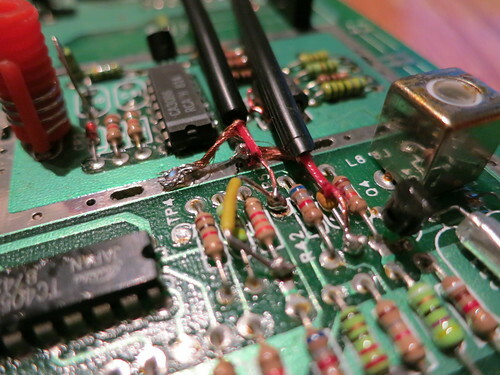 That’ll save you having to disassemble everything if, for example, one of your solder points is slightly loose. Not that I’d know anything about that. 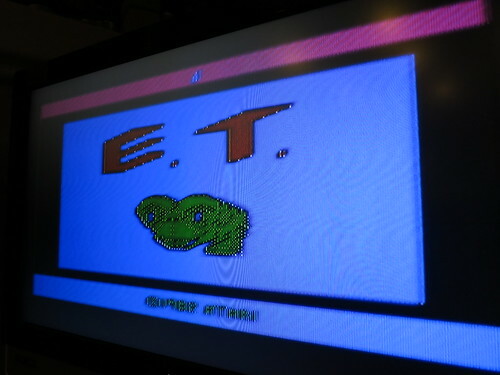 All the credit for this goes to Thomas Clancy and the crew at AtariAge. 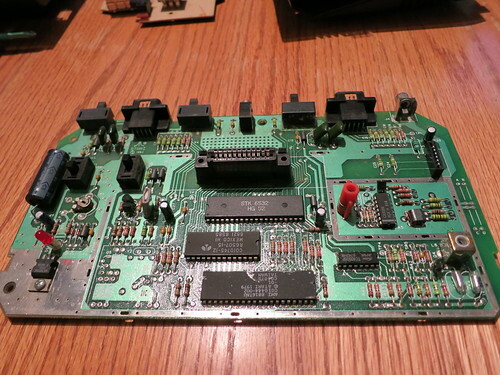 I was just following the excellent instructions in the 2600 FAQ. 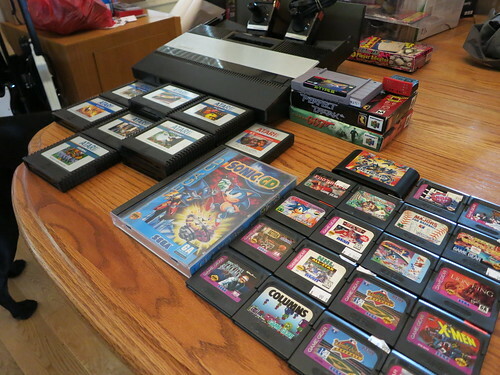 Today was the first day of the Seattle Retro Gaming Expo. We were there bright and early at 8:45, as people who pre-ordered tickets got in at 9 while everyone else had to wait until 10. The perfect plan to score the best gear! 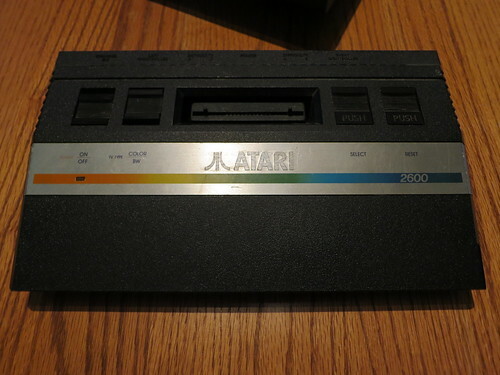 An Atari 5200 complete with AC adapter, two controllers, Star Raiders, Galaxian, Super Breakout, Defender, Football, Pac-Man, & Centipede. All of that ran me less than $200 including the $40 spent on admission. The most expensive item of the bunch (other than the 5200) was R-Type III, but it was totally worth the $20 I paid. I’m a R-Type fan of the highest order – I’ve got a functioning R-Type cabinet, and what’s starting to be a fairly complete R-Type collection on console. At some point I’m going to need to sit down and figure out just how complete my collection is and figure out what it’ll take to finish it. A couple of weeks ago I came home to discover that I couldn’t access any of my media. My music, photos, and movies were all offline. They all reside on a Drobo that’s connected to a Shuttle PC running Windows 7, so I went to check it out. Someone probably turned it off by mistake, right? At first glance, it’s definitely off. The power button doesn’t seem to have any effect. Is it plugged in? Yes. Is the surge protector on? Yes. Hmm. So I disconnected everything, carried it over to the nearest table, and removed the case. Are computers supposed to smell like smoke? This computer was 3-4 years old, rocking a Pentium dual-core with 2GB of RAM. It was slow when I bought it, but it was designed for low power-draw and silence – and it did that very well until the end. Rather than try and figure out what component had committed suicide and replace it, I decided it was time to start over. I already had a great HTPC case sitting idle in my A/V rack – an Antec Fusion Remote Max. In each case, there was a particular reason that I chose that component. Motherboard: I’ve been using Asus motherboards for 20 years, so it was only a question of which Asus Z77 motherboard for me. The P8Z77-V is the least expensive model with an Intel Gigabit NIC instead of a Realtek one. CPU: The i5-3570K is the lowest end of the Ivy Bridge CPUs with the new 4000HD integrated graphics. Since this machine is primarily a server and not used for gaming, I wanted to give that a shot. If it’s enough for my needs that’ll save money, keep the noise down, and dramatically reduce the power draw of the system. RAM: This particular pair of DDR3 will run at 1600MHz with decent timing (8-8-8-24) while needing only 1.5V to drive it. A nice all-around set of specs for only a few dollars more than the cheap stuff. Last weekend I got everything assembled and burned it in (Memtest86+ & Prime95). It’s connected through my receiver to my 61″ TV over HDMI. A few benchmarks show it’s actually much faster than I expected it to be. Most importantly my Drobo is back online – and oh, how I missed those 4TB of storage when they were gone.